I’m guessing this is the scenario: It’s the start of the new year (or maybe it’s later when you’re reading this), but you’ve already broken your resolution to stop your skin picking habit. Again. Ok, I want you to know firstly that there’s nothing wrong with you. It’s not because you “should” have more will power. It’s not because you’re not strong enough. It’s because a compulsive skin picking habit is really more like a skin picking addiction. And unlike an addiction to alcohol or drugs, with picking, the substance is your skin and it’s within reach of you all the time! This all means it’s not as simple as you’ve been thinking it is. You’ll never recover by simply trying harder not to pick. 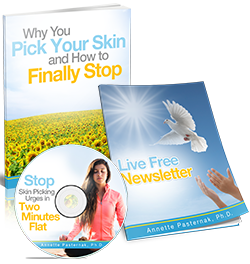 Compulsive skin picking is a complicated beast and you need to learn some tools, you need a change in mindset and you need to know how to apply positive changes consistently to wear it down. Do I have a lesson for you! 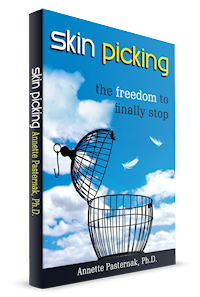 This 50 minute video is chock-a-block full of useful advice you can start to apply now for a reduction and eventual freedom from skin picking. Get out your notebook now. You’ll definitely want to take notes. Did you watch it? Let’s have a conversation. What did you find most helpful? Did you have any insights that you haven’t had before? Please share in the comments below. Let’s stay in touch! Don’t leave without signing up for the free Freedom Kit on the upper-right side of this page.